Bookworm Boutique: My Favourite Collage Apps! I thought it might be helpful to share with you all my absolute favourite collage apps. While searching for these, I found that it was super frustrating when I was limited to nine images, or I couldn't change the size of one image, or that I had to "unlock" better features, I must have deleted about 20 collage apps that were nothing like they were advertised to be. I find these apps are the best for users of Instagram, as most of them only save square images, but I also use them for my Facebook page! 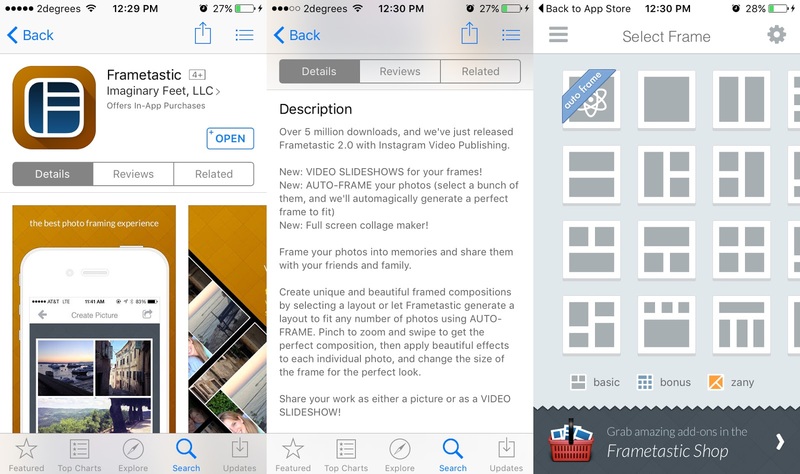 Frametastic is the collage making app I've been using the longest, and despite it's annoying ad spaces, it's a really great app. Like most collage apps, it has the standard features (the ability to have different sized boxes, change the space/border between photos/etc). For a fee, you can unlock 60+ bonus frames that have different layouts. It also has an actual collage maker, where you can add photos like the page in a scrapbook. I don't think I'd ever use that feature, but it's still pretty awesome. You can also pay for a video/GIF feature, which will bring each photo to full screen and then put it back in the collage, which is awesome for those of you advertising with a small space! Photogrid might not be my go-to app, but it's definitely still useful. Why? Because it lets you add more than nine photos, yay! Because most apps will only let you make square photos, it usually means that ones with four or nine photos look the best. Luckily for me, and it took me a while to find this app, Photo Grid lets you add more than nine. 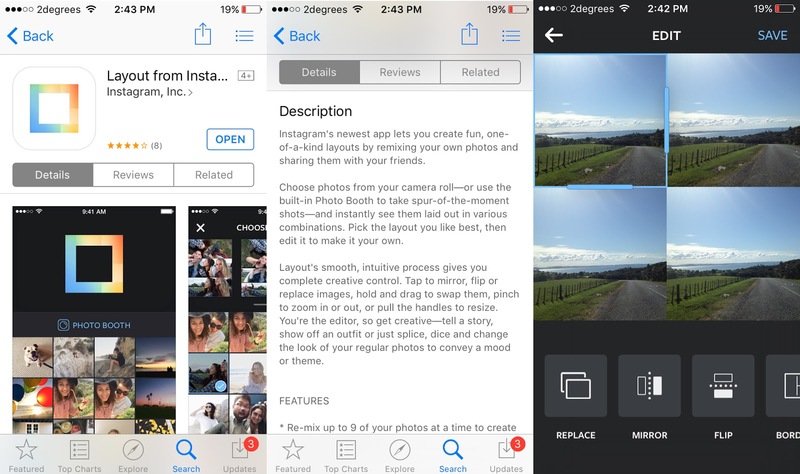 It also lets you change which photo is the feature. 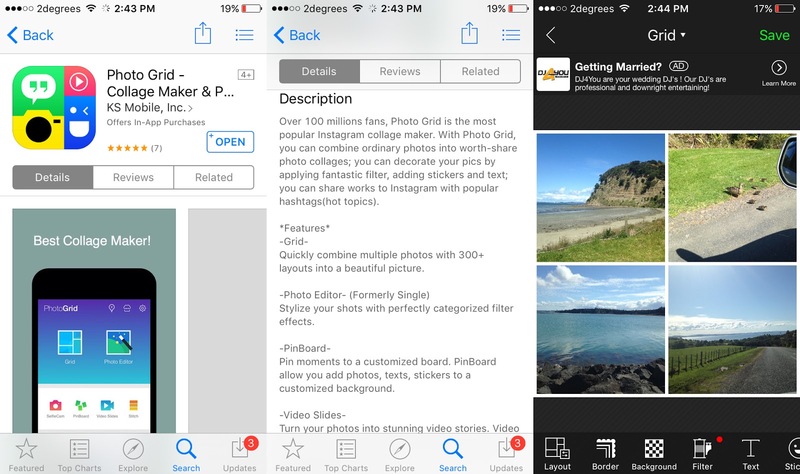 While it suggests the best layout, you can drag the edges of photos out to make a different one the feature and it'll automatically fix the other photos around it. You can add filters, text, stickers and more to your collage and a different background if you don't like the white lines in between photos to be white, but you can also get rid of the separators all together. Okay, okay. I know this one is a bit obvious. Especially since for those of you who use the Instagram were subjected to IG practically yelling at you "Have you seen our new app?" and "Have you downloaded our new app, yet? It's great! Here's what it does!" and I have to say I was a complete sucker and downloaded it, mostly because I couldn't cope with their constant messages, but I wasn't too surprised to see that this new addition was actually useful. Layout is very similar to other collage apps, but it does have a very nifty little feature. If you tap "faces" when you first open the app, it'll pick out all the photos with faces (selfies, for example) and only have those photos in your stream. You can, of course, just have it set to "all photos" or set the app to pick from a certain folder. Once you've selected your favourite layout (hehe) for your photos, you can adjust each individual photo. By selecting one, Layout will give you the option to replace, mirror, flip the image and also mess with the borders. In terms of further editing, there's not much you can do. That's it for this Tech Tuesday, which I will admit is only the second one I've done. But I quite enjoyed doing these little rundowns of what each app offers. If you've got any requests for Tech Tuesdays please leave them in the comments below! I don't have a ton of ideas for them, unfortunately, but I'm hoping that I will soon.